Named after the old automobile showroom it currently occupies, Packard's New American Kitchen presents a refreshingly eclectic menu that is paired with carefully selected wines and craft beers. Packard's offers a seasonal menu that uses the freshest locally sourced ingredients whenever possible to create dishes that tantalize the taste buds. This restaurant has an inviting vibe, and people can come and enjoy craft beers, wine, and a cheese board or Bloody Marys during Sunday brunch in a comfortable environment. Packard's New American Kitchen in Oklahoma City also has an inviting rooftop, where customers can enjoy their cocktails and various menu offerings under the stars. This restaurant has both good food and ambiance. Reservations for Packard’s New American Kitchen can be made online via OpenTable or by contacting the restaurant directly at (405) 605-3771. For parties of six or more individuals, reservations are required. The menus at Packard’s New American Kitchen consist of fresh seasonal foods that are made with locally sourced products. From the vegetables to the meat, freshness is the name of the game when creating a menu that has a little something to offer everyone. Some of the menu offerings are as follows. 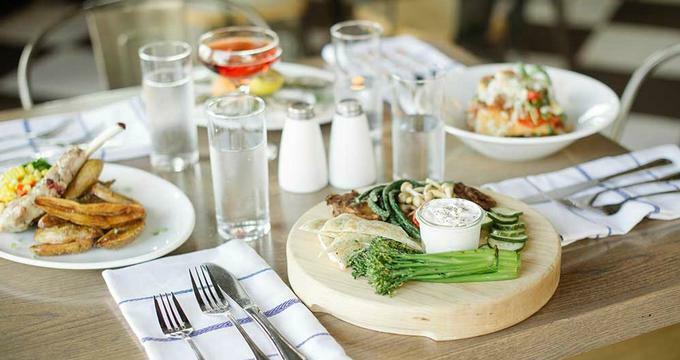 · Dinner Menu - Shareables: crab beignets, Brussels sprouts, PEI mussels, and more; salads; entrees: smoked ribs, salmon, duck breast, pork chop, blackened redfish, roasted half chicken, lentil curry; dessert: creme brulee, cheesecake mousse, chocolate cake, and bread pudding. · Lunch Menu - Salads; sandwiches: mushroom melts, grilled chicken, breakfast club, burgers; plates and bowls: shrimp and grits, Buddha bowl, mac n’ cheese, and more. · Brunch Menu - Cranberry muffins, breakfast board, salads; sandwiches; sides; eggs and more: eggs Benny, fried chicken biscuit, frittata, French toast, biscuit and sausage and gravy, pancakes, and more. The rooftop at Packard’s New American Kitchen is a major highlight as it functions as a lounge area and bar where customers can enjoy their cocktails while getting an amazing view of the city. Packard’s New American Kitchen offers private dining space within the restaurant as well as on the rooftop. The enclosed private dining space is located across the lobby from the restaurant. The space is fully customizable for any event as it can accommodate up to 80 people, and it also has additional perks such as audiovisual setup. Both semi-private and private rentals are available for Packard’s rooftop. Packard's New American Kitchen will also assist with creating a custom menu for any private event as well as provide catering for an off-site event if so desired. Additional detailed information regarding private rentals at Packard's New American Kitchen is available on the restaurant's website. Packard’s New American Kitchen gift cards are available for purchase online via the restaurant’s website.